Planning a trip to Nepal is not as easy as planning a vacation in Hawaii or Europe. Nepal is one of the most distant destinations on Earth if you are starting your trip from North America, and it takes almost 2 days just to get there. A trip to this Himalayan kingdom requires a great deal of advance planning. You should set aside plenty of time to make all the necessary arrangements to ensure your journey is as enjoyable as possible. When should I go? How do I get there? What do I need to pack? Where should I stay? What kind of restaurants are there? What should I see? The single-most-important thing to know about flying to Nepal is that with relatively few flights into the country, seats book up months in advance during the peak trekking seasons. Try to make reservations at least 6 months in advance, especially if you want to fly on Thai Airways or Singapore Airlines. By July or August, you'll find that nearly every flight into the country during this period is wait-listed. Royal Nepal Airlines, which is infamously unreliable, is usually the last airline to fill up. There are no direct flights from the United States to Nepal, so unless you fly Thai Airways, Singapore Airlines, or Pakistan International Airlines, you're going to have to change airlines somewhere en route, usually in London or Delhi if you are eastbound or in Bangkok or Singapore if you are westbound. You'll also have to spend a night somewhere en route-Bangkok, Singapore, Karachi, and Delhi are the usual overnight stops. If you are traveling through Delhi, it's a good idea to have an Indian visa, even if you aren't planning to leave the airport. We've had reports of people being refused onward passage because they didn't have a visa, even though they were only transiting through the airport. Visa extension fee for 15 days or less is US $ 30 or equivalent convertible currency and visa extension fee for more than 15 days is US$ 2 per day. Tourist visa can be extended for a maximum period of 150 days in a single visa year (January - December). 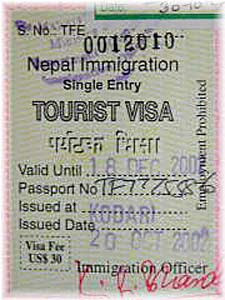 Gratis (Free) Visa: Gratis visa for 30 days available only for tourists of SAARC countries. Transit Visa: Transit visa for one day can be obtained from Nepal's immigration offices at the entry points upon the production of departure flight ticket via Tribhuvan International Airport in Nepal, by paying US $ 5 or equivalent convertible currency. ya' gaines....u'r right..visit the highest country Nepal wher Mt.Everest lies..
ya Gaines.u'r right..Nepal is one of the most beautiful country in the world and it is the highest country where Mt.Everest lies..so don't miss to visit Nepal !